President Trump on Wednesday amped up his criticism of NFL players who kneel during the national anthem to protest racial injustice. In an interview with “Fox & Friends” that aired Thursday, Trump moved past his most common complaint of disrespect and cast peacefully protesting players as threats to their billionaire employers. Trump claims his obsession with these protests has nothing to do with race. That was always a lie though, and Trump’s coded language, making peaceful black demonstrators out to be dangerous threats to their wealthy white bosses, reveals it. The NFL is already pushing back against Trump’s claim, calling it inaccurate. Players and owners are not feuding, NFL spokesman Joe Lockhart said Thursday. They’re united. “I think [the owners] made it clear they support our players, but also support our country, the national anthem, the flag — all of the things some have suggested we don’t,” Lockhart said. The irony of Trump’s ceaseless attacks on the NFL is that rather than make life harder on ownership, he provided them an opening. 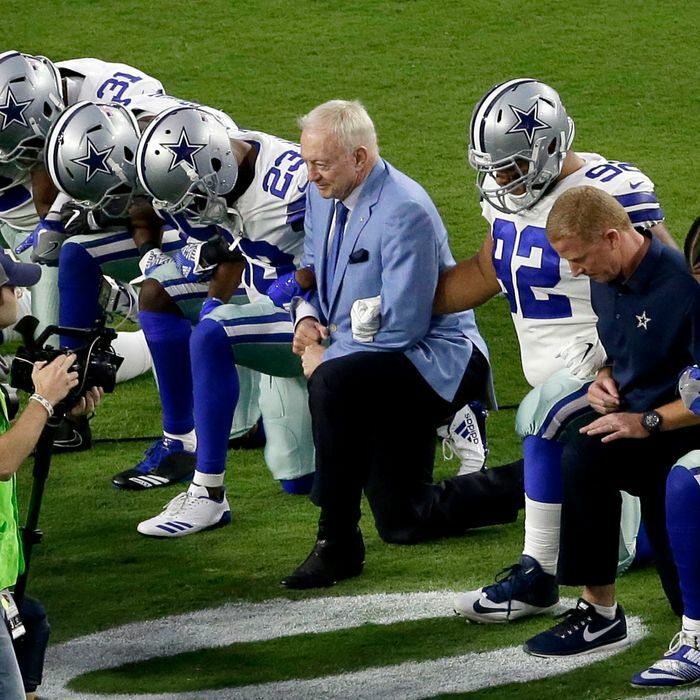 After weeks of players protesting and owners not knowing how to respond, Trump made it easy for everyone to unite against him, a position that most Americans can get on board with.